Back in December, I came home from Costco with a box of persimmons, like you do, then realised that I was never going to be able to eat them all myself. I rarely eat fruit as it is, so 6 huge persimmons seemed like a mountain of fruit to me. Plus when I tried one, it wasn’t wholly ripe, or tasty. So I tried roasting some; why not, it works for vegetables, I thought it might perk up my persimmons. Following this experiment, over the festive period I decided to offer this as a dessert choice for my visiting family. I cut the persimmons into segments, tossed them with a tiny amount of olive oil, then roasted them for 30-40 mins at 200C, moving them around the pan halfway through. Served with yoghurt, they provided a perfect alternative dessert. The leftovers lasted a couple of days and were just as nice cold, again with yoghurt and another day with my porridge. I shall be sharing this with everyone at this week’s Fiesta Friday, co hosted this week by Shinta and Diann….it’s been too long since I joined in! This entry was posted in Dessert, Fruit, Leftovers, Snacks, Sugar Free, Tahini, Vegan, Vegetarian and tagged cooking, persimmons, recipes on January 11, 2018 by Elaine @ foodbod. What would you feed me…Chitra? So, this week, Chitra, what would you feed me? When Elaine approached me for guest post, I was really thrilled and it was a great honour for me to be here. “What would you feed me” is a series of guest posts initiated by Elaine and I am glad to be part of it. It is a great opportunity given to me by her to meet new people thru her blog. I get inspired by Elaine’s Vegetarian healthy recipes mainly Salads and Dips variations. Knowing Elaine’s inclination towards spices and sugar free dishes. 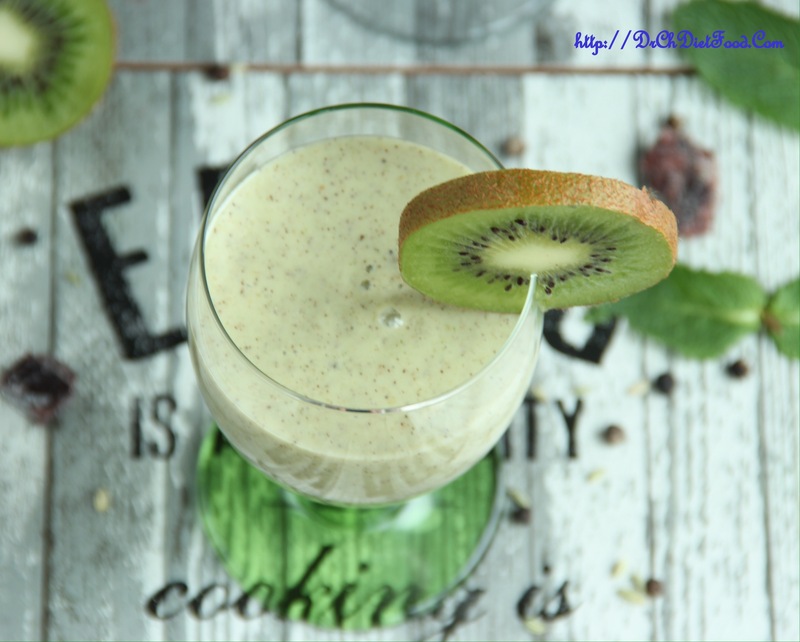 I wanted to try something which fits to ‘What would you feed me’ series, as well her healthy blog concept, so tried this Spiced Kiwi Lassi instead of Sweet Lassi. Thanks again Elaine for the opportunity. 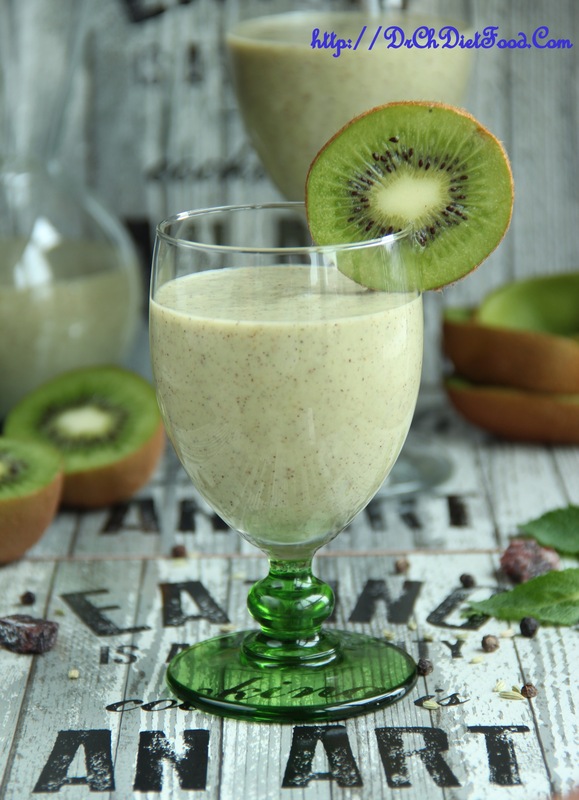 Kiwi has more vitamin C than an orange and it’s seeds are rich in Omega 3 acids. Supports learning process, boost immunity system and helps your skin to glow. Fennel seeds (Saunf) are very effective for digestive problems. These seeds can be chewed upon or had as a tea decoction for beneficial effects upon the stomach. In India, these are routinely chewed upon after meals to aid in digestion after a rich meal while acting as herbal mouth freshener. Cardamom– Elaichi or cardamom not only does it add sweet taste and unique flavour to your dishes. Cardamom contains chemicals that appear to treat stomach and intestinal spasms and gas, and increase the movement of food through the intestine. • Place all spices (ground pepper, cardamom pods, fennel seeds), salt , mint, in a blender and pulse until coarsely crushed. 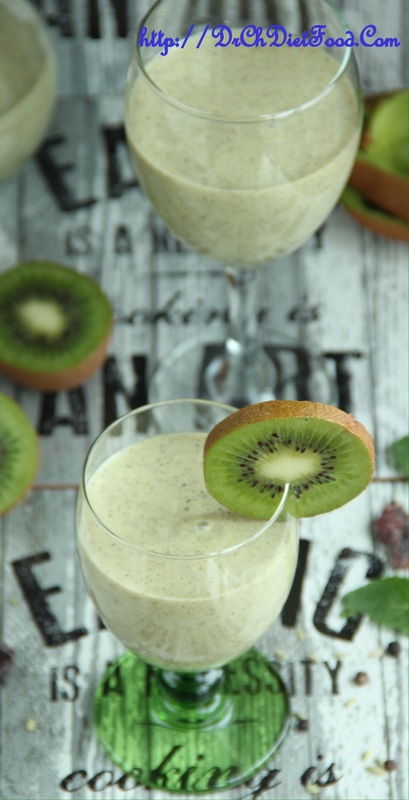 • Now to this add kiwi fruit, yogurt, mint and continue to blend until smooth. • You can add more milk to reach your desired consistency and ice if you like a frosty smoothie. This entry was posted in Fellow Bloggers, Fruit, Gluten Free, Healthy, Snacks, Sugar Free, Vegetarian and tagged chitras healthy kitchen, cooking, recipes, spices, what would you feed me on April 29, 2015 by Elaine @ foodbod. What would you feed me…Melissa? When I invited Melissa from The Glen House to take part in my guest post series I knew that it may well be a challenge for her to fulfil the guidelines of bringing a vegetarian, sugar free, gluten free, healthy dish, but she jumped at the chance of being involved, which made me very happy! Lovely, friendly, vivacious, Melissa makes amazing cakes, she loves baking, and eats very differently from me, but her post captures the essence of the series completely, I hope you enjoy it.. So, Melissa, what would you feed me? Elaine asked me write a post that was gluten free and sugar free. Me? Me that uses copious amounts of sugar, chocolate, butter and flour in her posts and in her every day life? Why not, I thought! Elaine and I are from the opposite ends of the foodie spectrum; she’ll often post a piece and my response would be something along the line that “it would be great covered in chocolate”. Elaine posts healthy dishes and snacks, whilst I write about cakes and cookies. How on earth could I write her sort of post? So, for the month of March I gave up sugar. I GAVE UP SUGAR. I-GAVE-UP-SUGAR!!!!!!!!!!!!!!!!!!!!!!!!!!!!!!!!!!!!!! No more cakes, biscuits, muffins, Haribo, chocolate, alcohol…. Even bananas and mangos were off limit! I stopped snacking altogether and stuck to three meals a day. While I was at it, I did away with potatoes and bread too! After two days of mind blowing headaches, I was ok. My sugar fix came from berries, I rekindled my long lost love affair with avacodos and my palette began to change. I lost a stone and a half in four weeks by eating this way- not diet AT ALL, just eating properly. New ways of cooking and baking called out to me; I discovered Ella Woodward of Deliciously Ella fame and Sarah Wilson, who has written several books on life without sugar. I began to understand how to use nuts and fruit to replace eggs, butter and sugar and how I can replace normal flour with healthier alternatives. So, I’m making Elaine a recipe I’ve come up with myself, based on my research. Preheat the oven 180 degrees and line a muffin tin. Blend the pecans to a fine powder in a food processer. Add them into a bowl with the other dry ingredients and stir. Mix the milk, dates, bananas and vanilla and blend until smooth. Stir the wet ingredients in with the dry ingredients and spoon into the muffin cases. Bake in the oven for 20-25 minutes. 32 days after giving up sugar and I can still count the amount of sugar based ‘treats’ I’ve had on one hand. I can’t honestly say that I will give up sugar completely, but I will never go back to eating the amount I did before. NEVER. This entry was posted in Breakfast, Dairy Free, Fellow Bloggers, Fruit, Gluten Free, Healthy, Sugar Free, Vegan, Vegetarian and tagged cooking, recipes, the glen house, what would you feed me on April 7, 2015 by Elaine @ foodbod.